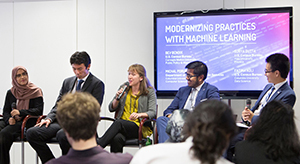 I recently had the privilege of learning about the “Civic Digital Fellows” program, an opportunity for innovative college students to help government by developing new technology applications that help agencies deliver their missions more effectively and efficiently. The story of the program is a great examples of how an entrepreneurial idea can lead to a model of how government can improve performance by accessing new ideas and talent. The IBM Center is pleased to publish a guest blog from the program’s founder, Chris Kuang, below. Government agencies aren’t typically known for being savvy about information technology. From the public meltdown of the healthcare.gov rollout in 2013 to a Veterans Affairs building being deemed structurally unsound due to the sheer weight of the paper files it stored (a strong case for the digitalization of many government services), examples abound of how poor IT systems impact how agencies are able to effectively serve the American people. At the same time, the United States federal workforce is growing older. Seamus Kraft, the Executive Director of the OpenGov Foundation, calls this trend the “graying of government.” A recent release by the Partnership for Public Service puts the proportion of federal employees under the age of 30 at just six percent, four times less than the national workforce. Though recent legislation signed into law will help attract young people to government, the reality is that agencies are currently missing out on the talents of a generation of students and recent graduates—especially those with computer science, design, and data science backgrounds. As a Harvard student, I saw a unique opportunity to inspire and empower my peers, who have largely grown up around cutting-edge technology, to pursue public service. Doing so would allow these “digital natives” to bring their skills and perspective to inform agency technical efforts. After all, who better to help government reimagine the future of its digital services than those who are most comfortable using and making the latest technologies? When it comes to recruiting and hiring young technologists, it’s worth looking to the private sector to learn what works. Many large tech companies, like Facebook, Google, Amazon, Microsoft, and others, have formal programs to attract and hire the best technical talent American colleges and universities graduate each year. Many people ask me: how can government compete? Our student-led nonprofit organization, Coding it Forward, has taken a first step in inspiring and empowering young people with technical skills to consider opportunities in public service and social impact. Coding it Forward’s flagship initiative, the Civic Digital Fellowship, partners with federal agencies looking to rethink both their digital needs and their talent strategy to host summer Fellows to work on high-impact projects. Fellows arrive with leading skills in software engineering, data science, product management, and human-centered design, ready to contribute to the work of their host agency. The 2018 cohort featured 36 Fellows hailing from 30 colleges and universities at both the undergraduate and graduate levels. The cohort was selected from an application pool that neared 900 students from across the country—one of many signs of the immense interest of many technology students looking to use their skills to serve. A full listing of Demo Day presentations and panels is available on GitHub. Fellows’ projects proved that for agencies, innovation is within arm’s reach. Emerging technologies like blockchain and artificial intelligence sound exciting and may shape how government operates down the road, but much of government today yearns for more concrete, tangible technological progress. Advances such as responsive web applications and automation that have been the status quo in the private sector for years have great potential to build more effective and efficient government agencies. The scale and scope of work that students were able to contribute to in just 10 weeks has sparked inspiration across government, and not just at the federal level, about the power of mission-driven technologists to drive innovation in bureaucracies that are often resistant to change. The Civic Digital Fellowship is modeled off of other successful government initiatives that embed new, technical perspectives in federal government, including the Presidential Innovation Fellows, U.S. Digital Service, and 18F. After a summer of civic tech and innovation, Civic Digital Fellows return to their campuses or embark on their career journeys with a solid understanding of the levers of change within government, inspired to use their skills to continue to create impact in the public space. Some Fellows enjoyed their experiences so much that they plan to stay on with their agencies after graduation. The future of government will be increasingly digital, so it must continue to do more to attract the next generation of digital leaders to its work. Chris Kuang is the Co-Founder and Executive Director of Coding it Forward. He is also a junior at Harvard University studying applied mathematics and economics.